Ref No Grave or Memorial / Rhif cyfeirnod bedd: D. 3. William Thomas Hughes and his brother John Edward were born in Llanasa in 1889 and 1891 respectively. Their parents were John and Catherine Hughes who were also born in the village. John senior was a lead miner. According to the census, by 1901 Catherine had remarried. Her husband Evan Williams was also a lead miner. She and her boys were still living in the family home in Mynydd, Llanasa. By 1911 Catherine, William and John had moved to Rose Hill in the Marian, Newmarket where her sons were employed as farm workers. At the time of the census Catherine’s nephew John Hollingsworth was also living with them. All three young men served in the First World War. William and John Hollingsworth both served with the Royal Welsh Fusiliers and brother John with the Army Service Corps (Mechanical Transport). 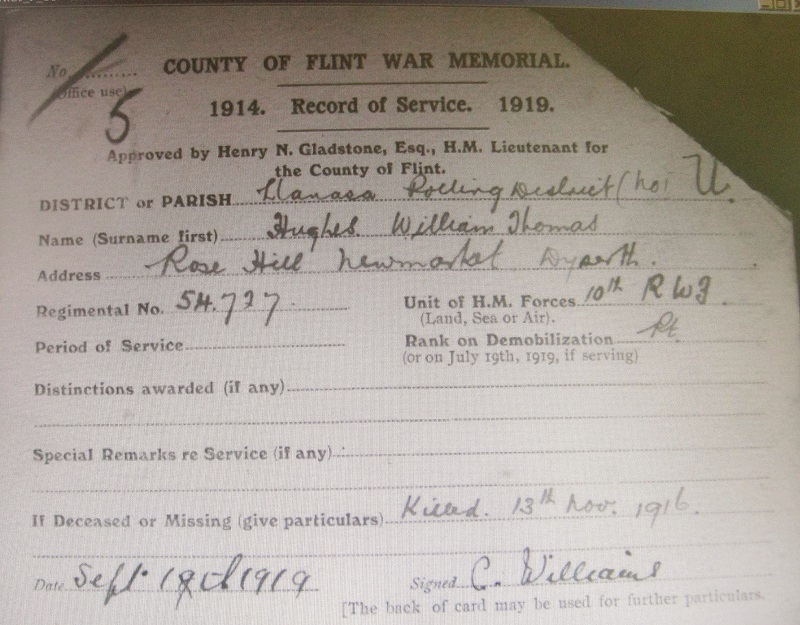 The service index cards in the Flintshire Record Office show that John Hollingsworth served for 4 years and John Hughes for 3½. What an anxious time it must have been for Catherine Williams. Sadly only two of the three came home as William was killed in France in November 1916. He is buried in Queens Cemetery, Puisieux, Pas de Calais, France. William’s Record of Service signed by his mother. The cards were cut diagonally to show that the soldier was deceased.